Last year was phenomenal for investors in the stock market. The S&P 500, for example, generated total returns exceeding 26%, the highest annual return recorded since the tech bubble of the mid/late 1990s. These positive returns likely had investors in a positive mood going into the holidays, which might explain why returns during the “Holiday Period” (i.e., the last trading day before Christmas through the last trading day of the year), when expressed on an annual basis, were even greater than the already stellar returns reported earlier in the year. Perhaps the holiday spirit had the effect of improving the returns observed earlier in the year, though the efficient markets hypothesis (EMH) instructs us that no systematic relationship should exist between Holiday Period returns and those from the rest of the year. If such a relationship existed, proponents of the EMH argue, than the aberration would be exploited by investors via arbitrage until the profit-making opportunity, and the relationship with it, disappeared entirely. Although the stock market produced Lumps of Coal 11 fewer times than expected since 1950, this difference is certainly not greater that what might be observed if returns in each period were caused by a random process. Additionally, the cloud of data in the scatterplot above illustrates that no discernible relationship exists between returns from the two periods. A statistical test confirms that virtually none of the variation in Holiday Period returns is associated with returns from earlier in the year. 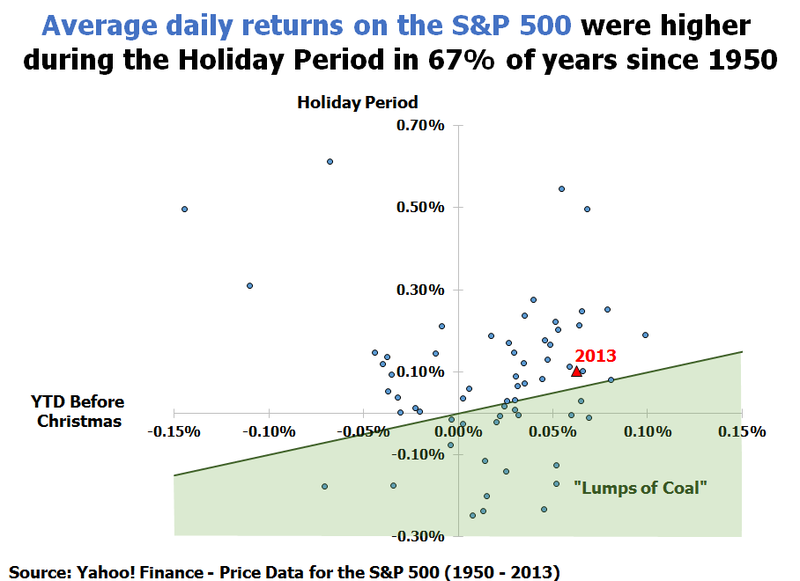 Accordingly, investors this year can be grateful for the immense returns during 2013 and the Holiday Period, but they should know that the stock market is likely to gift Lumps of Coal in future Holiday Periods.